Every two years there is a frenzy on Ravelry to organize or join an Olympics “team” and participate by choosing projects to knit. Remember when the US Olympic Committee brought down the hammer on Ravelry to stop calling this event “Ravelympics”? Seriously. Remember how demoralizing it was to serious Olympic athletes that knitters were co-opting the Olympics name? No, neither do I. End of rant. Anyway, though I love a bandwagon as much as the next knitter, I’m not organized enough to join a team. Plus I don’t need any added pressure when I’m knitting. So I didn’t join any Ravelry team, but I did choose some projects to knit while I watched many happy hours of cross-country skiing and speed skating and ice dancing. I love the Winter Olympics. Speaking of grey, I also love grey and grey! 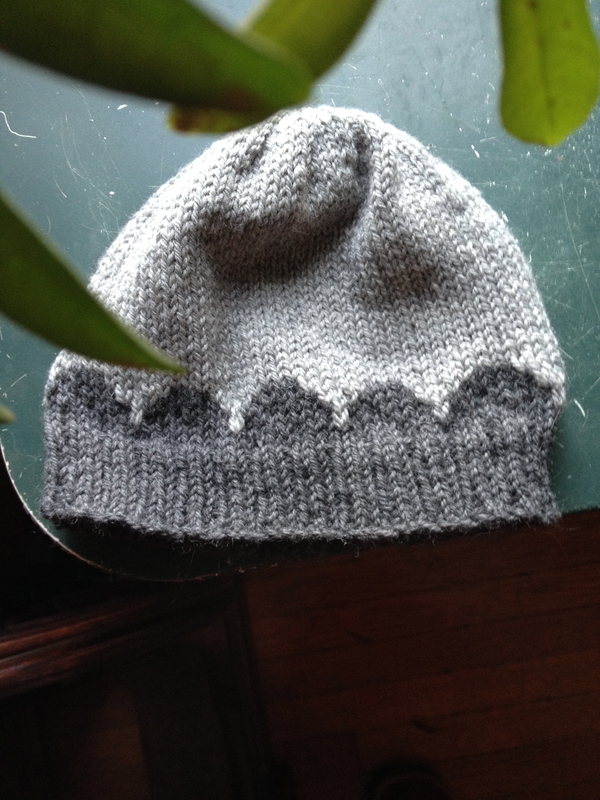 This is Little Scallops Hat by Maria Carlander. The pattern is in Swedish, but there’s an English translation at the bottom of the page. 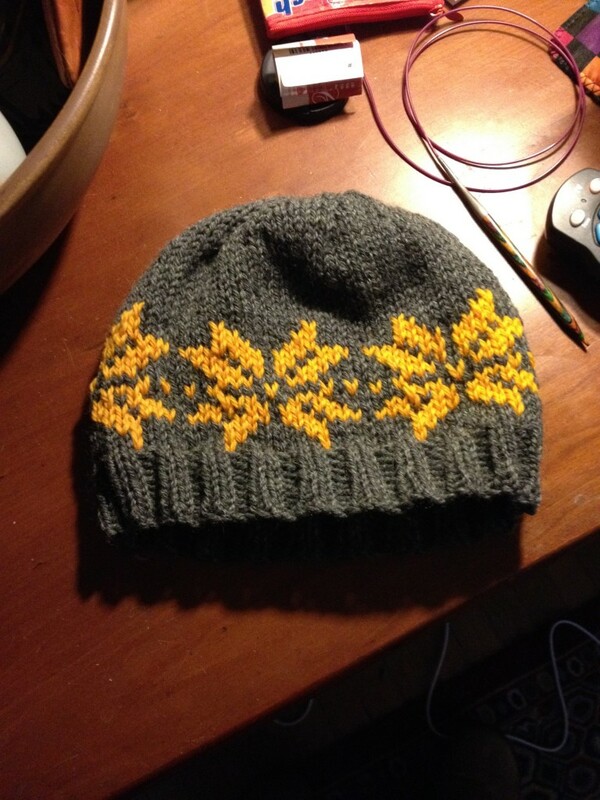 It’s written as a child’s hat, but once again, I really just threw the colorwork chart (which I am cuckoo-crazy about!) on a Shrek Hat. 80 sts on a #7 needle, more Cascade 220. 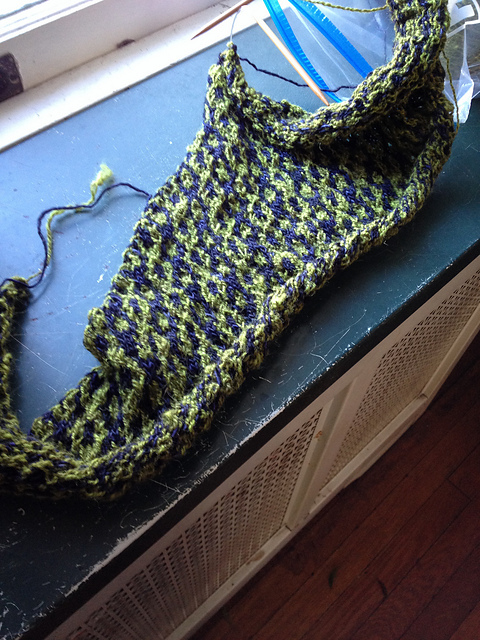 I love love LURVE this sock yarn – it’s Schoeller +Stahl Limbo Color, sadly discontinued. 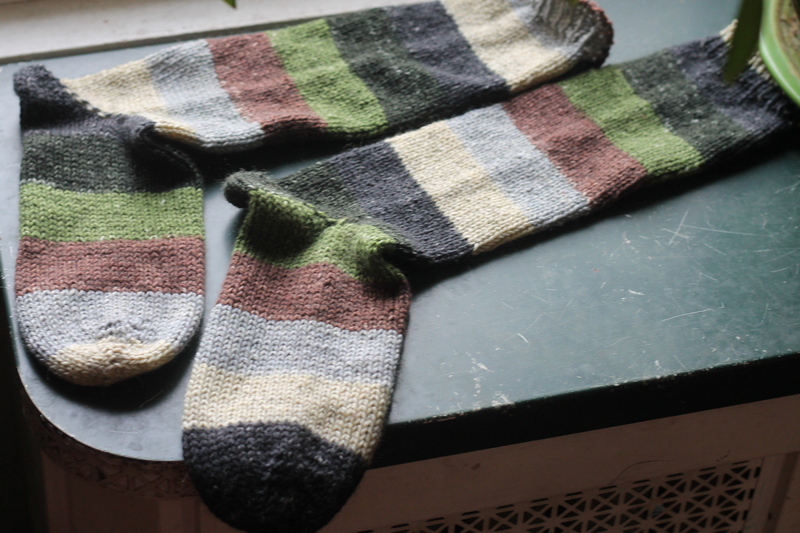 It’s a beefy dk-weight sock yarn that knits up in these amazing wide stripes that please me. 44 sts on #4 needle, magic-looped. The pattern is my Easy Toe-Up Sock pattern, which not coincidentally, is my go-to sock pattern. I used up some handspun! 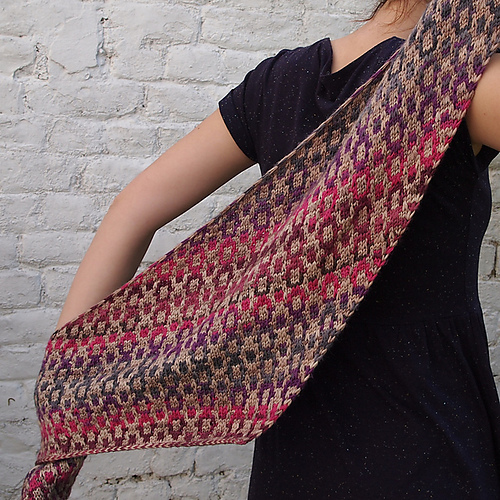 This is Age of Brass and Steam, one of my alltime favorite shawl patterns (this is my third go-around), using Painted Tiger silk and merino fiber which I spun carried with a strand of sparkly white KidSilk Haze. 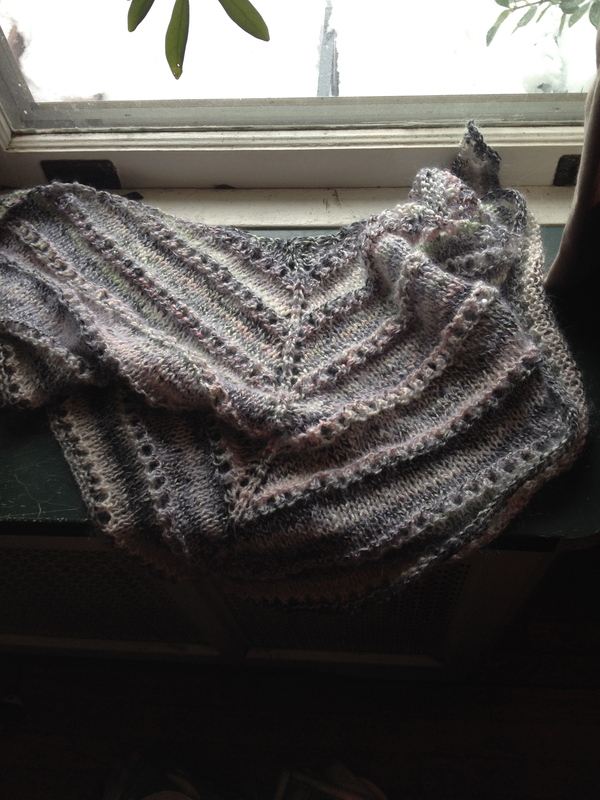 This isn’t blocked (I am still not 100% confident about blocking KSH and also yarn that has a heavy silk content) and is also not a great photo. But you get the idea. I’m tired of buying dumb pillows! It came to me like a lightning bolt (DOH!) 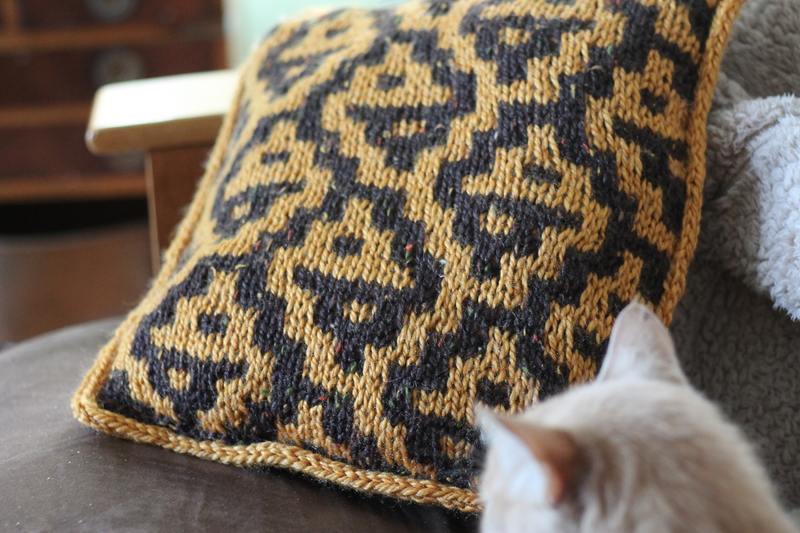 that I could use my own pattern, the Easy Mosaic Pillow, to make some nice colorful new pillows for our couch. I used some leftover bulky weight big box yarn. I love how it turned out. Cat is optional. I’m always sad when the Olympics end, especially the WInter Olympics. It was nice to have an excuse to start a billion new projects, and it was nice to knit them while watching all the skiing and skating and shooting. Yee HAW! Way to go, Margaret!! You get a gold medal!